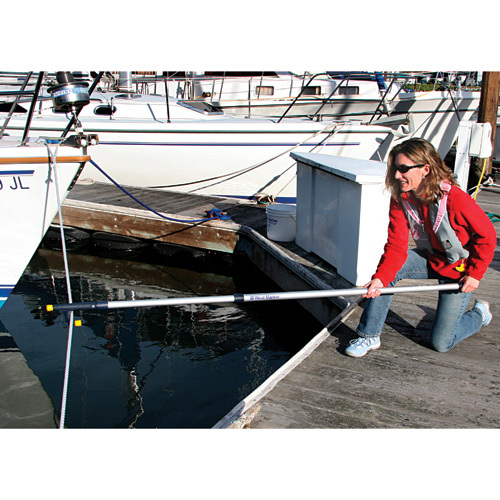 Pick up that mooring or grab a dock line with our 8' boat hook or long 12' boat hook. Both compress down to only about 4 1/2" in length. Grab lines and fend off easily with these floating boat hooks. They feature anodized aluminum tubing that telescopes quickly and twist-locks securely. Glass-filled nylon heads are curved to aid in line retrieval and the soft tips prevent scratches. For larger boats we offer a choice of two boat hooks that telescope from 53" to 8' or 54" to 12'.Spare yellow tips sold separately (Model 11869088). WARNING: This product can expose you to chemicals including (DINP) diisononyl phthalate which is known to the state of California to cause cancer. For more information, go to www.P65Warnings.ca.gov.